Surfing has become a very popular sport activity in Portugal in the last couple of years. Every year, people from all over the world come to Portugal for surfing. One of the most famous places for surfing in Portugal is the Algarve. In this article we will tell you everything you need to know about surfing in the Algarve. The Algarve isn’t merely about beautiful beaches and a great climate. 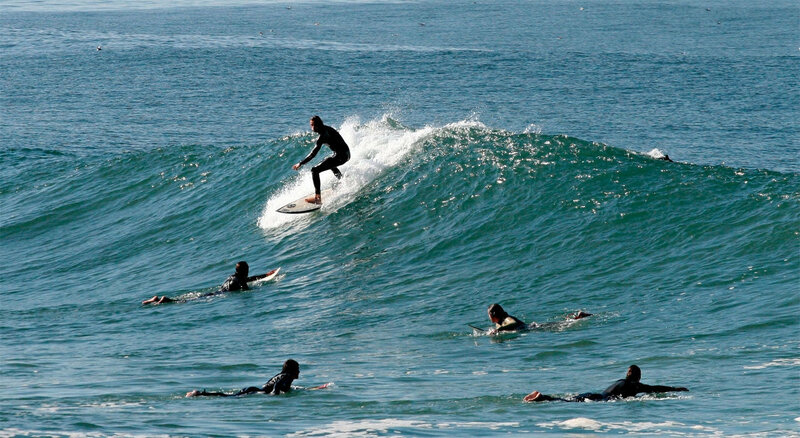 The region also has excellent surfing conditions. The waves are consistent, every day of the year. The water is warm and clear blue. The atmosphere is laid-back and people are friendly. The combination of action, nature, fitness and adrenaline is the reason why surfing in the Algarve is so addictive to many. The Algarve really is a surfer’s paradise. Surfing tourism is a niche area of tourism in the region. However, surfing in the Algarve is an activity that is growing in popularity, especially among young people. Every year, more people come to the Algarve for surfing and surf lessons. The west of the Algarve is situated next to the rugged Atlantic Ocean which creates good waves 365 days a year. 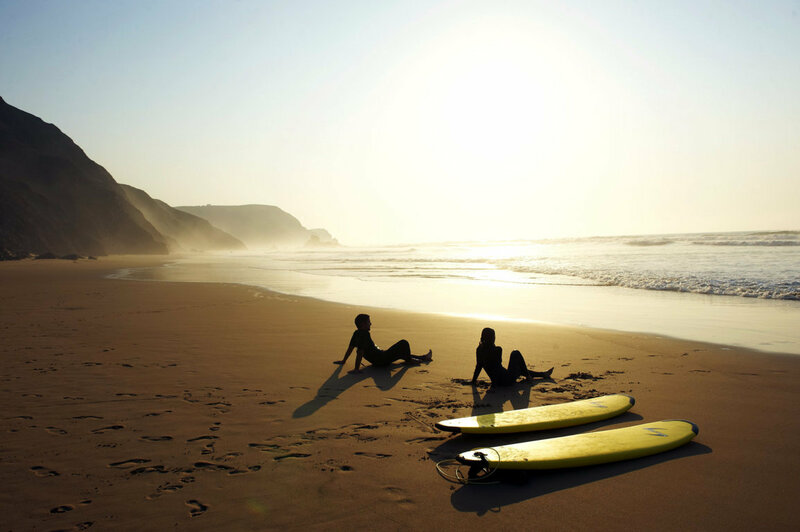 In the Algarve, every day is a possible surf day. This is quite unique. Many other surf destinations in the world cannot guarantee that. According to the Portuguese tourist authority, the Algarve has the best waves in Europe. They are so confident with their claim, that the authority even offers free holidays for surfers who didn’t find waves of more than 50 centimeters on 3 consecutive days, on one of 28 selected beaches. Praia do Martinhal. This is a popular surfing beach. Praia do Tonel. This is a beach within walking distance from the town of Sagres. Easy to access. Many restaurants and bars nearby. The waves are consistent. Praia do Beliche. This beach near Sagres has large cliffs, which makes it a stunning place to surf. Praia do Zavial. Great beach for intermediate surfers. Praia do Amado. This beach near the village of Carrapateira is one of the hotspots for surfing in the Algarve. Surfing conditions are excellent, which is why many surf schools travel there daily to enjoy the waves. Praia da Arrifana. This is a great beach near Aljezur. Good waves, the but beach can be crowded at times. Many surf schools can be found here. Praia da Bordeira. This is a large stretch of beach in the wilderness, near the village of Carrapateira. Conditions are great for surfing. Praia de Odeceixe. This beach is near the village of Odeceixe and is famous for its beautiful views. Praia da Amoreira. This beach is relatively close to Ajezur, and is not as well known as other surfing beaches. Praia de Monte Clérigo. This beach near Aljezur is less crowded than other beaches nearby. It is often described as a surfer’s paradise. Praia do Castelejo. This is a secluded beach with nice views and conditions that are good for learning how to surf. Go here with an instructor, because there are rocks in the water (that you want to avoid). Are you going to the Algarve for some sun in general and is surfing just one of the many things you will do? Then probably anytime between May and October is best. Are you going to the Algarve for a full surf course for several days? Then basically any month will do, but be aware that some surf schools can be closed in January or February. Just check beforehand it the surf school of your choice is open. Are you an independent experienced surfer, and are you looking for the biggest waves? Then avoid the summer months. In general, the waves are bigger in the winter than in the summer. The winter in the Algarve is quite mild and almost feels like spring. The water actually still has a very comfortable temperature in the winter. Some people say that it is too hot for surfing in the summer, while others say that the sea can be especially refreshing on a hot summer day. In any case, make sure you always bring sunscreen, as the sun can hit quite hard, even in the winter. Surf lessons are a must if you have never surfed before. Fortunately, there are many different surf schools and hostels available for those who would like to learn to surf. This is a great solution for people who are backpacking in the Algarve and did not bring any surf equipment. With the help of an instructor you will learn to surf faster and also learn how to stay safe in the water. In addition, these surfing schools have deep knowledge of the local area and can show you the best spots for surfing. 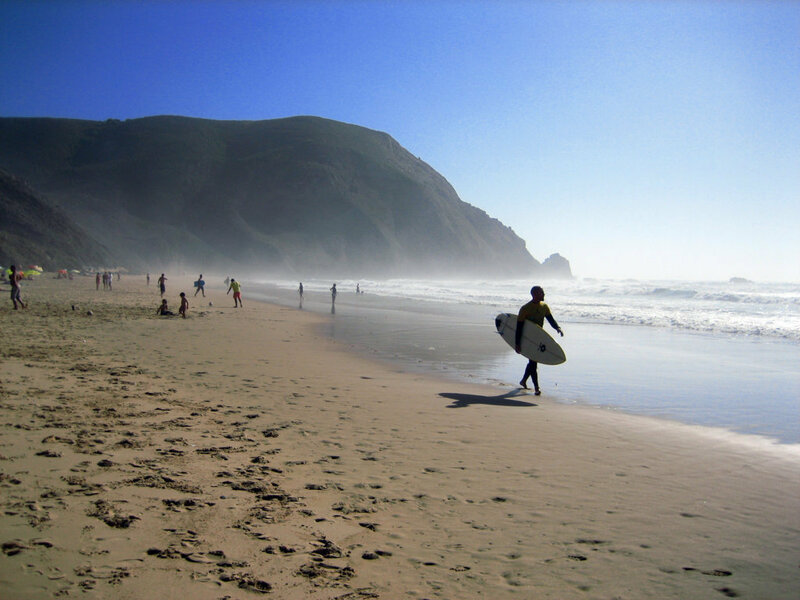 While some surf schools are located near the beach, others will take you to specific beaches on the West coast every day to surf. You can take a class for one day or take a whole surf course for several days. It is also possible to combine your surfing experience with a peaceful retreat and yoga. This is several of the surf schools above. If you would like to know how the surf conditions in a specific area are, download the free Magicseaweed app on your smartphone (available for iOS and Android). This app is a must-have for the serious surfer. The app provides surf forecasts for many places worldwide, including the Algarve. Forecasts include the surf height, swell height, swell period and direction, wind speed and direction and the water temperature. Extreme surfers who prefer bigger waves, go to Nazaré (about 130 kilometres above Lisbon). In 2017, the Brazilian surfer Rodrigo Koxa set a new world record, by riding the biggest wave (24.38 metres high) that was ever surfed in history. 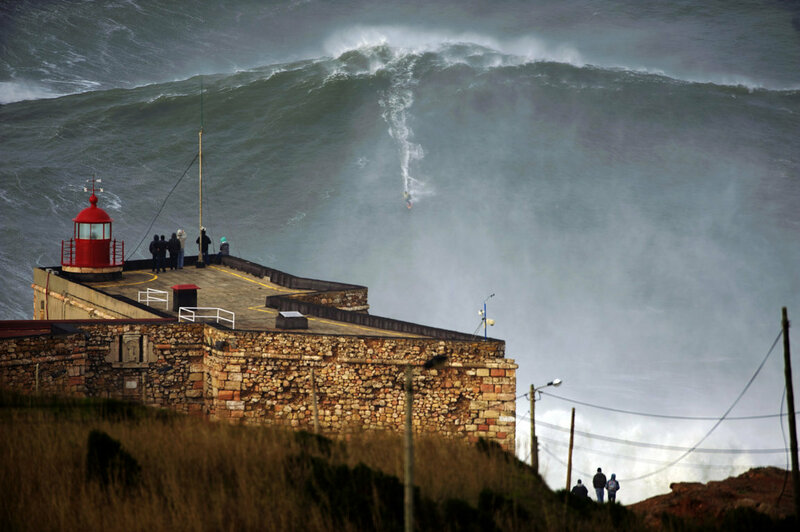 He broke the previous world record of Garrett McNamara , who rode a wave of 23.77 metres in 2013. Both of these events happened in Nazaré. Thank you for this amazing website. 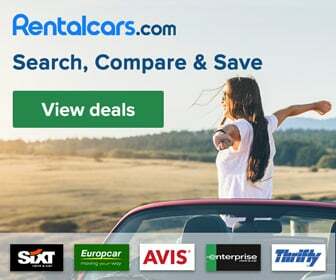 I am planning a trip to Algarve in June and this site is helping me a lot! Do you recommend any company or places for parasailing and for tile or pottery painting workshop? I am keen to do some experiences, so if you have any other recommendations, I would appreciate! Hi, thanks a lot! 🙂 Parasailing is especially good near Albufeira/Vilamoura. You can find several companies that offer that. For tile painting workshops there is a company in Ferragudo we know, called Arti Arte Azulejar. Have fun!